Just a year out of Plymouth High School, driver Arie Ouimet is making a name for himself on the race circuit. Arie Ouimet of Plymouth has a famous surname, being a descendant of legendary golfer Francis Ouimet, whose victory as an amateur in the 1913 U.S. Open Championship at The Country Club in Brookline was the stuff of legend. Now Arie is making a name for himself on race courses. 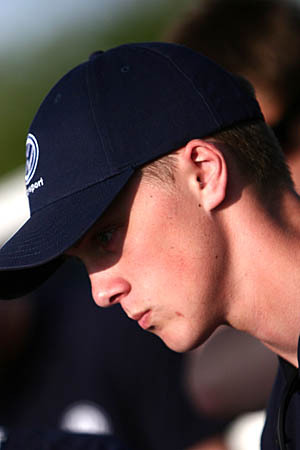 He's parlayed a decade of kart racing success, including the 2008 eKarting News driver of the year award, to a spot in the 2010 Jetta TDI Cup series. On Mother's Day, in his third race of the season, he served notice that he's going to be a factor in the series despite his rookie status by finishing second at New Jersey Motorsport Park after qualifying fourth. 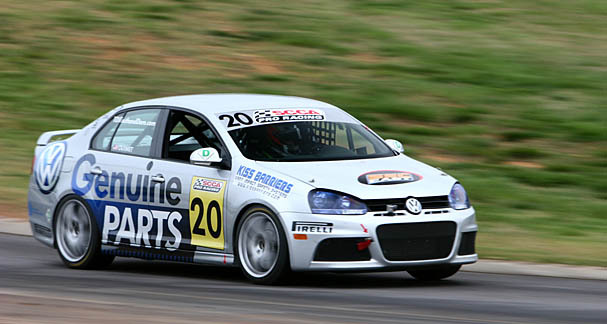 The TDI Cup is a Volkswagen-operated spec racing series that's now in its third season. For aspiring race-car drivers, it's the most coveted step up the racing ladder in the United States. The cars are slightly modified street-version Jettas. They have the same 2.0-liter, 170 horsepower, four-cylinder TDI lean diesel engine. The six-speed DSG automatic transmission is calibrated for quicker shifting, and the cars have racing tires, beefed-up suspensions and brake components, along with racing seats and a roll cage. Earning the opportunity to compete in the series meant that Ouimet, a 2009 graduate of Plymouth South High School, had a tough decision to make at age 18: Pursue a mechanical engineering degree at UMass Amherst or choose to go racing full time? "There were pros and cons each way," says Ouimet, now 19. "What if you have a bad wreck and get a head injury? On the other hand, what if you do well and get a big sponsor? I chose the racing route. In high school, I missed 35 days of classes my junior year to go racing. I was lucky that math and science came easily to me." Continuing to do both wasn't an option in college. "I knew I couldn't do each 50 percent," he says. "You have to commit. I'm learning that everything you do in life is an education. So we'll see where this goes." In truth, Ouimet has been preparing for years. Since his family moved to Massachusetts in 2006, he's worked for R.J. Valentine, founder of F1 Boston in Braintree and F1 Outdoors in East Bridgewater. Valentine also has helped as a sponsor of Ouimet's karts and TDI racer. "R.J. set the bar high for me right from the beginning, and he's never lowered it," says Ouimet. "He's prepped me for what it takes to be a racer, and the biggest lesson is that the driving is the easiest part. He stressed that results are a result of the amount of work you put in. He taught me the importance of selling yourself to potential sponsors, to speaking well, to network-building. He's given me a hands-on education." Says Valentine: "I've been at the racing game long enough to know if a guy has what it takes to make it. We (at F1 Boston) spotted Arie a long time ago. He's savvy, works hard and thrives on competition." Ouimet breezed through the first stage of national qualifying for the TDI Cup, serendipitously held in karts on his home (East Bridgewater) track. The final selection process in Las Vegas was a different matter. "I was confident in my abilities; not necessarily confident I'd be selected, but that was my goal," he says. Once in the series, Ouimet had to make the transition from kart to car. "They're very different," he says. "Karts are barebones with rear-wheel-drive, much quicker steering and a tube frame. The TDIs have suspension, front-wheel-drive, the paddle-shift DSG transmission, and much more weight." On April 23-25 at Virginia International Raceway, Ouimet struggled early. He qualified 16th for the first race and 14th for the second. Once the green flag dropped, he continued to develop, moving his No. 20 VW Genuine Parts and Service TDI up through the field. He finished 10th in the first race and eighth (later moved down to 10th again) in the second after an "on track" incident. "What happened is that someone went off the track and the yellow flag (caution) came out. You can't pass under yellow, but I had to swerve to avoid crashing when an emergency vehicle came into our racing line and wound up passing two cars." Valentine approved Ouimet's approach. "You've got to stay in the game. Guys who spin don't win," he said. Ouimet was encouraged by the results. "Only half points are awarded in week one so it's not quite as crucial. Plus I didn't bang up any fenders." That's important because drivers are responsible for repairing crash damage in the identically prepared and maintained cars. "In going over the data, I learned where to pick up speed. I know I had the feel of the track during the second race. If I'd qualified in the top eight, I think I could have won the race. My lap times were faster than the leaders' at the end. "You can take thousands of lessons from defeat but very few from victory. That's another thing R.J. always tells me," says Ouimet, who clearly put those lessons to use on Mother's Day. The series resumes with Round 4 June 5-6 at Miller Motorsports Park in Utah.